Until now, it was important for us to see the beginnings of Baptists in England. Beginning with this lesson, we will consider the Baptist beginnings in America. The establishment of Baptist thought in America is more complex than that of England. One historian (perhaps too sweeping in his analysis) notes that the Baptists in America were paving their own way. While it is true that Baptists in America were a parallel movement to that in England, they do find the origins of their thought, and in some cases, their churches in England. Even though America was a “howling wilderness” many considered it a land of promise. The Puritans found that reforming the Church of England may be easiest in a new locale. The Separatists fled to the new land to find freedom. The Pilgrims boarded the Mayflower to come to America because of Arch Bishop Lauds tyranny. On board the Mayflower were Puritans (with a sprinkling of Separatists). They landed on the shores of America on December 21, 1620. They established a colony along with their state church in Plymouth, Massachusetts. The Baptists (and other dissenters) came over from England for the same reasons. They could no longer endure the tyranny of the Church of England. They thought “the Puritans who had shared persecution with them in England would receive them gladly.”2 They thought wrong. The Puritans were not committed to religious freedom as much as they were committed to establishing a pure state church. Hence, the Baptists were generally unwelcome. Banishment was a severe penalty for it meant one had to wander the “howling wilderness” with its dangers (Indians, wild animals, severe winters). 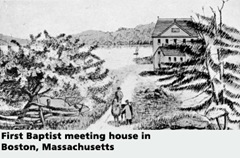 The early Baptist settlers were from various regions in England. From Wales came John Myles who settled in Rehoboth (1663) and later moved to Swansea. The middle colonies were more favorable to growth than New England. There was a “commingling of religious and cultural groups which made for a greater toleration than would have been possible otherwise.”7 The General Baptists (Arminian) settled in New England, while for the most part Particular Baptists (Calvinists) settled in the Middle Colonies. In the south both groups were represented. Pennsylvania and New Jersey gave more religious liberty than any other colony. The Baptists from Wales, Ireland, and England settled in the area. The city of Philadelphia became a place of convergence for these groups. Initially, the greatest concentration of Baptists was in the North. Very few congregations were founded in the South until the Great Awakening in 1726.8 Usually those churches planted in the south were established by those who were forced out of New England (e.g. Screven was driven from Maine to South Carolina). Since Virginia was first settled by the English (ca. 1619), they were unfavorable to the dissenters. A contingent of General Baptists from England settled in circa 1700. Later, they summoned the Particular Baptists in London to send them preachers. Robert Nordon came in 1714. The Baptists left England because of religious persecution in England. They believed they would receive a warm welcome by the Puritans and Congregationalists for they also were persecuted in England. Not so. Once they arrived they met severe opposition. The Puritans were very strict and demanded that others conform to their ways. This was not the freedom that the Baptists expected to find. One example of the attitude toward the Baptists can be found in the situation at Harvard. Henry Dunster came to America in 1640. He was made the first president of Harvard. A well respected president, Dunster made Harvard a schola illustra10 which “flourished in the profession of all liberal sciences for many years.”11 Dunster, himself, was regarded as a master of the oriental languages. He was present at many trials against Baptists. Having witnessed the trial of John Clarke (et al) he became convinced of believer’s baptism. He began to preach the same in his own church at Cambridge. This quickly forced his resignation as President in 1653. The Overseers of the College were heartless individuals. They threw Dunster and his family out of the president’s home (which he built) in the middle of winter. Later, he was brought to trial for failing to sprinkle his infant daughter. He died five years after he resigned his position at Harvard. To add to the dilemma, Baptists found themselves in some internal conflicts. Four influential men arrived in America. Keach was a Baptist before he came, while three others (Knollys, Clarke, and Williams) developed into Baptists after their arrival. Hanserd Knollys fled to America and started a church in Piscataway (now Dover) New Hampshire. At this time, Knollys still could not be considered a Baptist. However, his church in New Hampshire was split on the issue of infant baptism. This brought persecution on him by the Congregationalists. He, with others from his church, fled to New Jersey and eventually back to England. Roger Williams was born in London, England circa 1603. He was an intelligent young man that served as a clerk under a famous jurist Sir Edward Coke. He went to Pembroke College, then to Cambridge University. It was during his senior year at Cambridge that he began questioning many of the Anglican beliefs. Offered the position of pastor in Boston, Massachusetts. He refused citing their failure to separate from the Church of England. When he got to Boston, he was given the offer to be the pastor of a very influential church. He considered it an “unseparated church” and “durst not officiate it.” He went to Plymouth to be the assistant Pastor to Ralph Smith. This pastor said of Williams, “A man godly and zealous having many precious parts, but very unsettled in judgment.” Williams left this church because it was not separated enough. He fled to Providence to help John Clarke establish Rhode Island. Williams went to England himself to get the charter signed. When he came back to America, he wrote many pamphlets on religious liberty. It was only three or four months that he was in Providence that he soon denied that baptism was biblical. He imbibed in mysticism. He became a seeker. Despite the fact that he drifted down many theological streams, Williams did much to secure religious freedom. He became known as the “Father of Religious Liberty in America.” This designation should not be applied only to Williams for Clarke had much to do with securing liberty as well. Born in England he was both a physician and a theologian. A Puritan, Clarke had remarkable skills in handling the Hebrew and Greek languages. 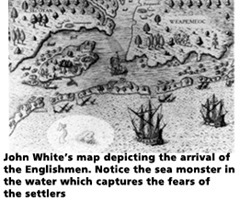 He crossed the “pond” and stepped on American soil 17 years after the Mayflower landed. When he arrived in America he found that the Puritans were in a dispute so he took a group of people New Hampshire. The winters were so severe that the group fled “south” to an island called Aquidneck. He purchased it from the Indians and called it Rhode Island. He and a group of men established two colonies – Portsmouth and Newport. God used Clarke to secure religious freedom for the Baptists in Rhode Island. This was just short of a miracle for a few reasons. Better yet, to offer freedom to a man who was now across the sea would be dangerous to Charles II. The statement that Clarke wanted to adopt would be very liberal in the eyes of Charles II. Elias rode on the coat tails of his famed father, Benjamin Keach. With that fame, Elias became a pastor in England without giving a testimony, nor having been baptized. He became a popular speaker and secure invitations to do so throughout London. The family name was good enough. He preached with unusual fervor from that day forward. He traveled to many cities and saw many come to Christ. He desired to make all of the new converts a part of his church in Pennepeck. Because of the distance between the cities, they gathered twice a year for a combined church service. This eventually failed and these believers began their own churches. These churches combined to make the first Baptist association in America, The Philadelphia Baptist Association. It took nearly forty years for this Association to adopt a doctrinal statement for they did not want to offend the General Baptist churches. In 1757 it had a membership of twenty-five churches. By 1762, there were twenty nine churches with 4,018 members. It helped with benevolent work. This included an educational fund, sponsoring a Baptist college, fighting for religious liberty. It provided fellowship for Baptists. 1) It has been well said that “the colonial period . . . is marked by faithful witness to the truth on the one hand, and by bitter persecution on the other.”22 In spite of persecution and fear of being banished into the “howling wilderness” believers persevered. That perseverance issued into the expansion of Baptists in America. 2) Men of all calibers showed courageous, sacrificial determination to carry out the Great Commission. 3) Doctrinal consistency was important to the early believers. Planting churches and associating with one another centered on similarity in doctrine. 1 New England Dissent 1630–1833: The Baptists and the Separation of Church and State, 1:6 quoted by Gerald Priest. 2 Torbet, History, p. 201. 3 Christian, History, p. 362. 4 Isaac Backus, History of the Baptists in New England. 1:359–60, Cited in John Christian, History, p. 369. 5 Cotton Mather, Magnalia, 2:459. Cited by John Christian, History, p. 359. 11 Prince, Preface to New England Psalm Book. Cited by John Christian, History, p. 365. 12 This group still exists today. 14 Armitage, History, p. 642. 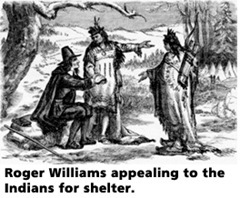 15 This was not an unusual kindness for Williams earlier “visited their wigwams, learned their language, and preached to them the good news of the kingdom . . . his sufferings touched the savage heart.” Ibid. 16 John Christian, History, p. 376f. 17 Maybe even four years earlier, but extant records show the date of 1684. See Torbet, History, p. 203. 18 Torbet, History, p. 210. 19 Quoted by McBeth, History, pp. 243–4. 20 Torbet, History, p. 245. 22 Vedder, History, p. 287. From Moses to You: Lesson 1: The Bible – What Is It?